It’s not a surprise anymore to turn on the TV or radio and hear the terms “hip-hop” or “rap” represented by bling, wearing, rock star partying, crunk, shawty snappin, chopped and screwed rappers wearing grills, with cookie cutter beats and repetitive hooks chanting “Ay, Bay, Bay” over and over again. It’s a disappointment that turned the young hip-hop fan in me away from the genre in the last decade. Sure the songs are catchy and fun to dance too, but hip-hop’s roots were all about bringing messages of social injustice and the struggle of the everyday man to the public in a unique voice. As far as the mainstream goes, that spirit lives on in a handful of artists like The Roots, Talib Kweli, Mos Def, and Common. The latter, I got to experience first hand last night. I’ll admit, it’s not the usual show I would find myself at, and required me to dress up more than the rowdy rock shows I go to where it is better to dress down. The Heineken Red Star Soul event at Boulevard 3 was a pretty chill and laid back environment. With seats lined up on the outer edge of the ground floor, and an upper level with more tables and plush chairs overlooking the stage. The floor area got more packed closer to show time and the crowd were definitely more than ready for Common after an energy building intro by his band. 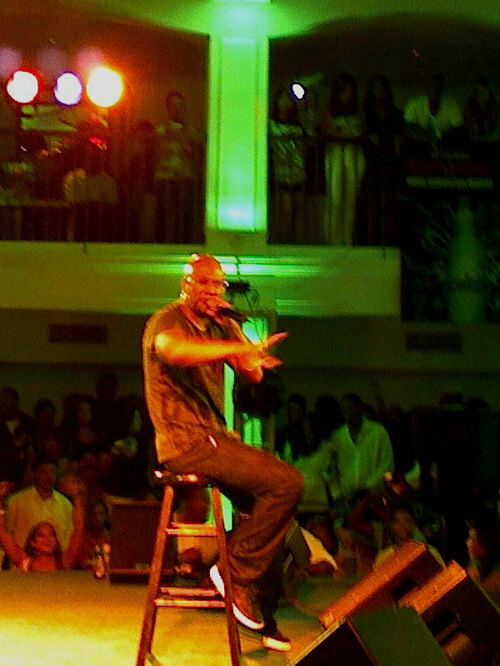 Common took the stage in full force, dressed casually in a grey shirt, dark pants, and black Adidas. With audience in front, on both sides, and above, he moved around often, giving attention to every section. Over the headbop inducing beats, Common was on fire in the set, spitting his rhymes loud and clear. Not overpowered by the music, or more concentrated in bouncing up and down, his lyrics brought every fan to a higher state of consciousness. His set consisted of favorites from his previous album Be, such as “Testify” and “Go!” to newer tracks off his latest disc Finding Forever like “U, Black Maybe” and “Drivin’ Me Wild”. During “U, Black Maybe”, Common raised his fist and asked the rest of the crowd to do the same. He expressed that the song was for everyone, no matter what race, color, sexual orientation, etc. The power of the song had the crowd pumping their fists in unison with Common. 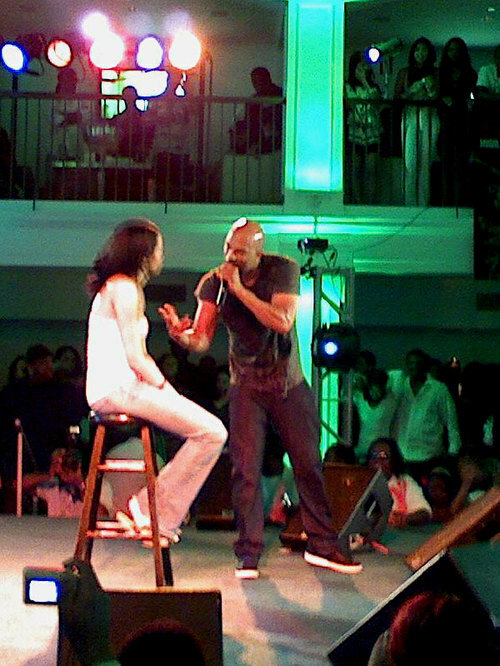 During a break in the set, Common pulled up a young female fan, dancing with her to Robin Thicke’s “Lost Without You” before dedicating a song to her and rapping to her onstage. Women in the venue swooned, wishing to be in that lucky lady’s place. 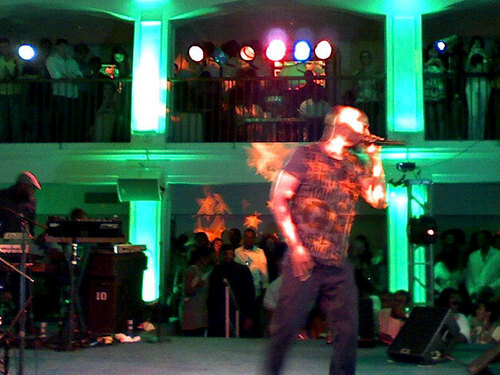 In his performance of “The People” toward the end, Common gave the audience a little bit of “Get ‘Em High”, a song he collaborated with Kanye West and Talib Kweli on Kanye’s last album. This was a great surprise to the fans that got them even more into the set. 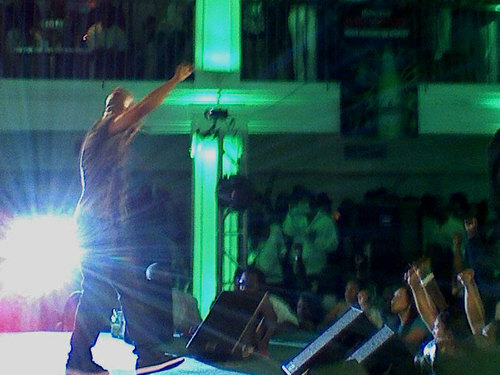 Common really tried his best to make the show special for the crowd, not only by throwing out surprises like the bit of “Get ‘Em High”, but changing up beats and hooks too. During a verse on “The Light”, the band and DJ went into the Nat King Cole/Natalie Cole sampled beat of Nas’ “Can’t Forget About You”. Ironically enough, Nas performs that song with Chrisette Michelle, who took the stage before Common on this night. Common even showed off his freestyle skills with a full freestyle rap, that included a message about his thought on the current political state. Overall, it was an amazing show. With great beats and thought provoking lyrics, the man once known as Common Sense really tries his best to make the show memorable for the fans. He brings a lot more to the table than 90% of the other hip-hop out there today. And he’s one of the few reasons why old school hip-hop fans like myself, haven’t lost all faith in the genre. I have to agree with your review many artists today are giving hip hop a bad name. It is always good to see an artist going against mediocre copies of todays music. Another good solid review. Nice review, Lou! That venue looks sweet. It almost looks like a mall show. I like that first pic of Common. He looks like he's on fire! And from the review you gave, it sounds like he really was. I appreciate it when rappers mix up their set and do some freestyling instead of presenting only what's on their album. It displays their abilities and gives the crowd a reason to enjoy the artist even more. Great review!